Series of cine-forum and conferences. "Cuadernos para la Paz, from Libya to Granada"
On the occasion of the exhibition of the Libyan artist Matug Aborawi that the Euro-Arab Foundation presents, a series of conferences and cine-forum on the theme of migrations and refugees have been programmed during the month of January. This series begins on Thursday 11st of January, with the screening of the documentary "Winter in Europa" by Polo Menárguez, which has been shortlisted for the Goya Awards 2018. "OUT OF TEXT. DIARIES FOR PEACE, FROM LIBYA TO GRANADA"
During the month of January, different conferences and cine-forum have been scheduled at the Euroarabe Foundation for the exhibition, which from December 20th 2017 to January 31st 2018, presents the work of the Libyan artist Matug Aborawi at the Euro-Arab Foundation. Documentary "Winter in Europe" by Polo Menárgez. Pre-selected for the Goya Awards 2018. Debate by 'Abdul', nurse in Afghanistan and asylum seeker, and the activists Marc Balaguer Rasillo and Natalia Sánchez. This documentary by Polo Menárgez tells how in the center of Belgrade, in old abandoned barracks at the old train station, hundreds of Afghan and Pakistani migrants live in temperatures bellow zero and subhuman conditions. Next to toxic fires, Asif, Said and Ahbar prepare to cross the border. In the debate that will follow the of the documentary, there will be a talk by Abdul, asylum seeker in Spain and nurse from Afghanistan. During his migratory journey, Abdul participated in the impromptu clinics with his nursing knowledge at all times. Together with him, some activists will also talk. They both have joined the work that has been developed at the project No Name Kitchen: Marc Balaguer Rasillo, who participated in the actions that the project developed in Belgrade and Natalia Sánchez, who did so in Athens and Belgrade. Screening of the TeleSur documentary "Mare Mortum" and subsequent debate on the importance of the media in the narrative of the events, with the journalists Lucía Muñoz Lucena and Sergio Rodrigo Ruiz. Currently, the waters of the Mediterranean are the most dangerous in the world in terms of the number of dead and missing people among those who embark to try to reach Europe. In 2017 over one hundred thousand people crossed the Mediterranean from Libya. This is what this TeleSur documentary by Lucia Muñoz Lucena and Sergio Rodrigo, journalists of EntreFronteras, tells us about. After viewing the documentary "Mare Mortum", the role of the media in information and education of citizens will be analyzed, on such important events as the tragedy of the millions of refugees and migrants who risk their lives. For the debate after the viewing of the documentary, the authors of the documentary, Lucia Muñoz Lucena and Sergio Rodrigo Ruíz, journalists at the social production company "EntreFronteras", will be present. Educational experience "Picasso in your hands": Armed conflicts and art, by professors José Manuel Vigueras Roldán and María Dolores Moreno Guillén. On Tuesday 30th January the session will be dedicated to Picasso's Guernica. To do this, we will have the educational experience that, about the current conflicts, has been developed by students of the Baccalaureate of Arts of Andalusia, in the project "Picasso in your hands". This experience got the Award for the promotion of educational research and innovation 'Joaquín Guichot' of Andalusia. The session, dedicated to high school students, will feature interventions by José Manuel Vigueras Roldán, professor of IES Severo Ochoa of Granada and María Dolores Moreno Guillen, professor of the IES Hispanidad de Santa Fé. The project "Out of Text. 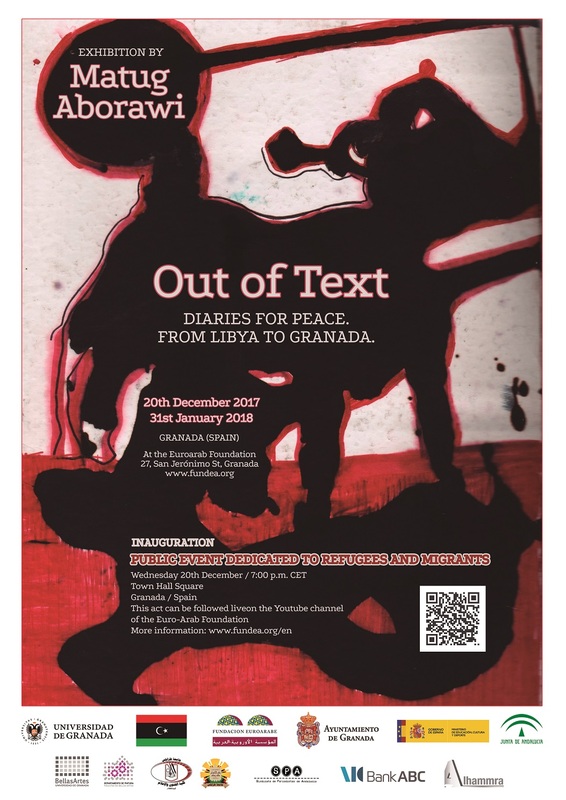 Diaries of Peace, from Libya to Granada", funded by the City Council of Granada, is part of the work carried out by the Euro-Arab Foundation in order to create spaces for dialogue and cooperation between the countries of Europe and the Arab World. A mission that in this case is developed through Art, with the project "Out of Text, Notebooks for Peace, from Libya to Granada", in which the Embassy of Libya in Spain collaborates, as well as the Faculties of Fine Arts of the University of Tripoli and Granada, the Union of Journalists of Andalusia and which a large number of NGOs from Granada and other cities. The exhibition that is presented in Granada until January 31st is the third one of this author that is organized by the Euro-Arab Foundation. The first of them, "Tribute to the Disappeared I" took place in 2012. Two years later, in 2014, he would present "Tribute to the Disappeared II. Arab Spring". The proposal presented by the Libyan artist Matug Aborawi at the Euro-Arab Foundation consists of several paintings collected in notebooks and works in small and large format. Oils, acrylics... All of them give account of the experiences of the artist in Granada until 2015 and in his homeland, Libya, from that date with the war as a backdrop. We can see the strenght both in visual arts and the reality behind every painting of the exhibition, and that is what will be seen by the spectators. Stories of survival, that have protagonists with names and surnames who run away from war, famine, misery and violence in an incredibly hard journey that lasts for years, while the rest of the world looks the other way. From the 20th December 2017 to the 31st January 2018. From 10:00 to 14:00 and from 17:00 to 20:00 (Spanish time), Monday to Friday (Fridays: only in the mornings).